I've got a pretty great OpWz going on -- I've never gotten a win with this race nor this background, so I'm hopeful. Actually, I've been feeling strong enough to consider going extended; Spellforged Servitor is such an amazing spell when combined with Orb of Destruction, Iron Shot, Airstrike, Fireball, Lightning Bolt, and Bolt of Magma. 117253 | Zot:1 | You fall through a shaft! I'm most afraid of the two Moths of Wrath here. I think I should probably go back downstairs and try to find another way back up. Edit: Zot has been cleared. Seems like I got the Ancient Lich ending. 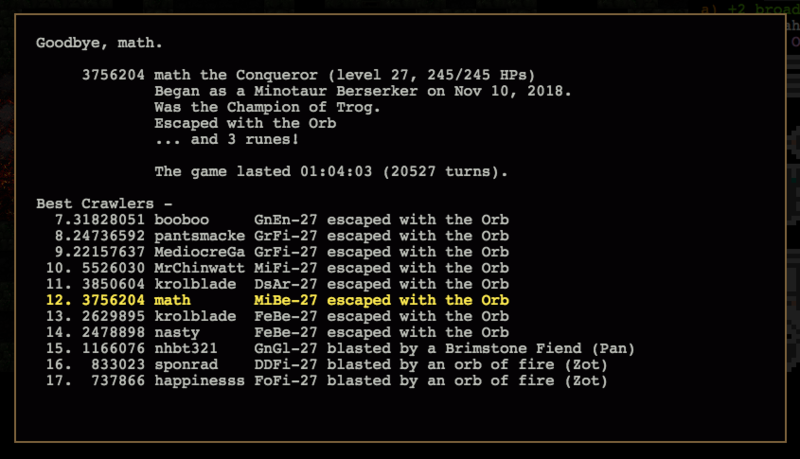 In total, I killed 11 Ancient Liches and 8 Orbs of Fire. I'm going to mentally call this game a "win" despite whatever happens next -- which is going to be me heading into Pan, I think. Wow! Most impressive! Good luck. Nice! 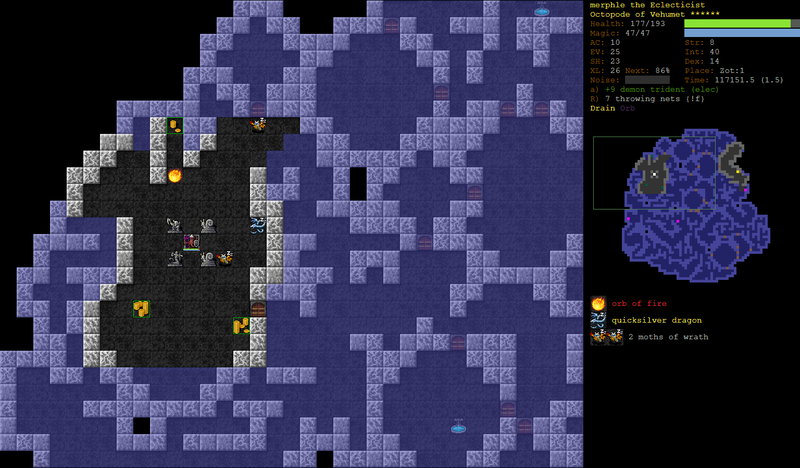 Getting shafted in Zot is seriously, seriously scary. Good luck with extended! Myself, I've been alternating between splatting HoMo^Beogh's and MfTm^Ash's. I chickened out. Cleared Crypt, got the Abyssal rune, cleared the Vestibule, and had a struggle getting through Cocytus. I made it to Coc:5 a few times, but it was quite a dangerous slog, despite rC+++ (and my other resistances were worse), so I snagged the Orb and hightailed it out of the dungeon with 5 runes. At least I can check Op and Wz off now. Congrats! Op is a tempting race but I've never had any luck with them. The idea is that each week, a specific combo is selected, and everyone has to play that combo. Bonus points are awarded for doing particular things during the run. And you get only a single attempt for that week/combo, so no need to spend every waking moment trying to get as many games in — this is definitely a “quality over quantity” competition (though you get one mulligan per week if you die before XL5). Read the Rules page for all the details. The first week is Human Wanderer. Put “# csdc” at the top of your 0.22 rcfile to sign up. No teams. Made it to D3.... where a glaive-wielding(!) orc warrior(!!) pushed my face in. If you do something particularly cool in your game make a note cool play with the : command. Follow it with a second note indicating where the play started and what makes it cool. The CSDC Replay team will look through cool plays and post highlight reels from each week. Managed to eke out a win despite getting pretty screwed with itemization. I think I used the rings I'm wearing (+3 protection and wizardry) for literally 80% of the gametime. 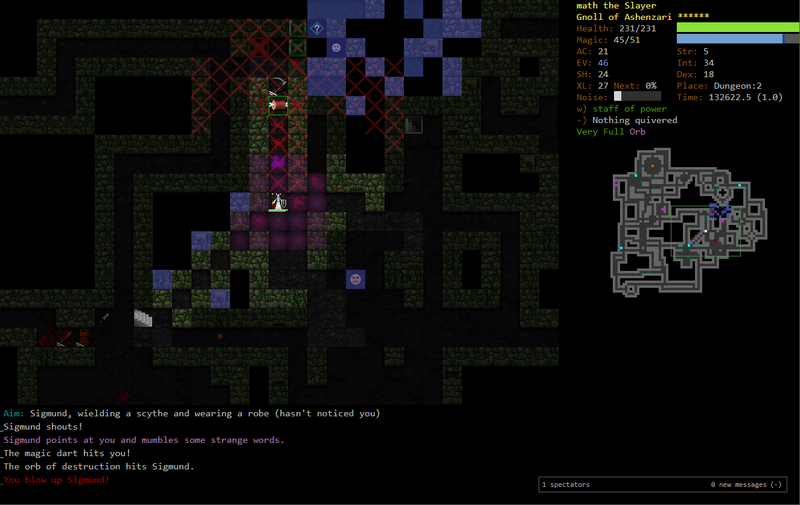 I had to wear a Chainmail of rF+ to deal with Orbs in Zot. As you can see, Iron Shot (1k+ casts) and Orb of Destruction (almost 500 casts) were my MVPs. Troll Conjurer is this week’s sudden death challenge combo. Sheesh. Nice. Drop all pretense of casting and just play a normal troll. Rather interesting new series by Demise. Looks like he'll be walking through every single god. Granted, a Necro's a little different, and it was awhile ago, but caster Trolls can work. I lost my troll in an Ice Cave, mostly because I was trying to get the "get a rune before using any scrolls or potions" bonus. I probably should have ignored the Ice Cave, and continued with my plan to head down to Slime and convert over to Jiyva. Up to 75 damage, according to Beem. My new strat is to go with a ‘#’ selection, rerolling if it comes up with a race I’ve already won. Otherwise, I play it. Eventually I’ll hit Greatplayer. Just knocked Centaur (warper) off the list. 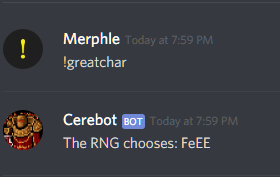 If you're subscribed to Beem, or you post on a Discord channel that Cerebot is watching (or direct message the bot works too, I found), you can use the "!greatchar" command to get a randomized unwon combo for you to try. Barachi Hunter is this week's combo in the sudden death challenge. I had a good run going last night -- I got the Swap rune easily, but over-extended myself while clearing the Snake vault and was swarmed. In retrospect, I should have burned more consumables (and burned them earlier in the fight) while trying to escape. I'd say that it was Barachi movement speed that killed me, but really Hubris is the Great Equalizer; I should have continued with my plan of drawing nagas out of the vault, instead of getting lazy and charging in that one last time. Wow, Quickcrawl is really fun! I've been thinking for a while that Crawl is just too long--way too many filler levels--and this fixes that nicely. I particularly like that each rune branch only contains the interesting final floor so you don't have to wade through the samey, boring ones. The balance is a little off still. XP gain is a little too fast, so that if you can survive to the middle game you can develop a ridiculously huge variety of skills. 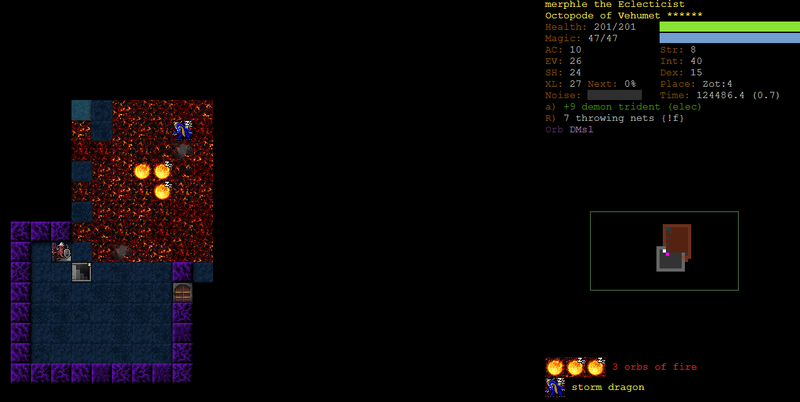 Also, minotaurs are still easy mode. Or maybe I got lucky. Nine species down, one less to go, HoMo is on the books. The highlight here was an absolute disaster of a Vaults 5 that took up every consumable I had at the time and at one point had me at 1 hp praying to Ash and every other god for a lucky Last Teleport. Got it! QuickCrawl is a blast but DAYUM is it all about the RNG. Another one done, VSVM. I'm not going to post every win here, but I wanted to say A) How great Hep is as a god and B) how great it was to explore the dungeon with Bonerchamp. Looks like CJR is shutting down. Are there binaries for QuickCrawl? I looked around a bit and couldn't find anything and I'm long since removed from building anything myself. 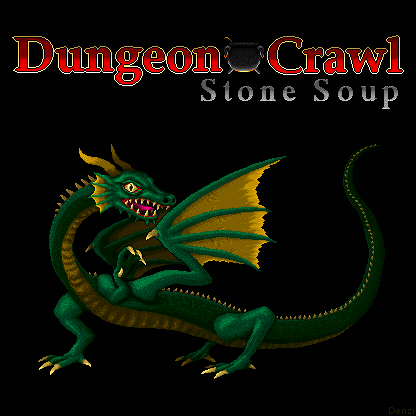 Looks like a lot of fun but it's tough for me to roguelike when I'm connected due to the whims of real life.